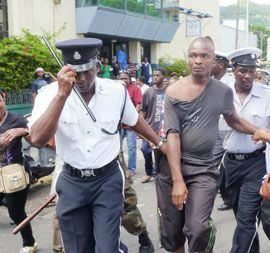 Audley Nanton of Brighton was taken into police custody shortly after a barrage of bottles was thrown in the direction of police officers, causing the damage to one of the state-owned vehicles. He was charged yesterday with damaging a windshield, the property of the Government of St. Vincent and the Grenadines, valued at $3,500. Nanton pleaded not guilty to the offence and was granted bail in the sum of $4,000. He has been ordered to report to the Calliaqua Police Station every Friday between 6:00 a.m. and 6:00 p.m. The matter has been adjourned to May 31, 2011.